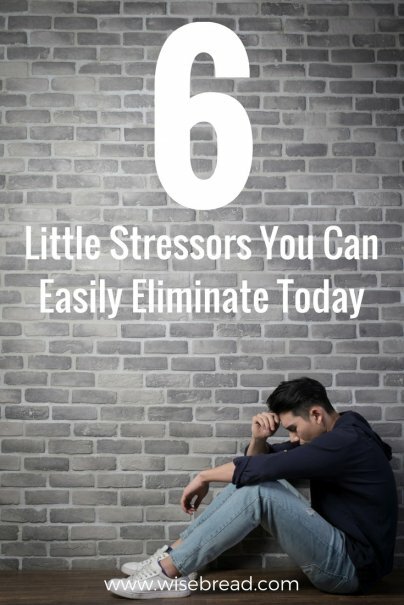 But while you can't snap your fingers and wish away big stresses, you can eliminate little stressors that impact your everyday life. Expunging minor annoyances that increase blood pressure and anxiety level may not provide complete peace of mind, but it's a good starting point. Here are six to set you on the right path. Whether it's a so-called friend, a co-worker, neighbor, or miserable relative (you know who you are, Aunt Silvie), some people may drain the life out of you and increase your stress level. You may put up with the abuse because of your history, but the last thing you need is a toxic relationship adding stress to your life. It's a common type of relationship. In fact, "84% of women — and 75% of men — said they'd had a toxic friend at some point," acccording to a study conducted by Today.com and Self Magazine. You don't have to banish these people from your life, but to enjoy less stress and more happiness, you have to acknowledge a toxic relationship sooner than later and deal with the toxicity, such as "taking some degree of responsibility for the situation" and setting boundaries. Nobody wants to deal with bumper-to-bumper traffic (especially if you are not a morning person), and research proves that traffic and your commute can be bad for your health. "It is very stressful — you have little control over it," says Dr. David Frid of the Cleveland Clinic. "And it is something, like most stressful situations, that can have an impact on your heart. It can increase your heart rate and increase your blood pressure, both which are very bad for your system in the short term as well as the long term." Researchers believe that honking and the sound of traffic can trigger elevated stress levels. But if you work outside the home and live in a heavily populated area, major slowdowns are inevitable and a bad start to your day. There's nothing you can do about traffic, but you can minimize its effect. "Leave with enough time so that if a traffic jam occurs… you're not going to be bothered by it," Frid says. "If you get caught in a traffic jam, it is what it is. Don't get upset about it. Listen to your (audio) book, listen to the radio." Whether it's at the grocery store or the bank — you can't escape long lines. And if you're tired, hungry, and stuck standing in a long line after finishing an eight-hour shift, this might be the thing that pushes you over the edge. Unfortunately, as long as there are people, there will be lines. But this doesn't mean you have to waste time standing in them. Take advantage of time-saving tools created to make your life less stressful. Just about every bank and credit union has a mobile app that lets customers deposit checks from a mobile device (this is one of the best technological advances so far this century, in my opinion). And I recently learned that Walmart (and many other grocery stores) now offers a feature that lets customers grocery shop online. Visit the grocery store's website, select items to purchase, choose a pick-up time (or delivery, in some cases), pay online, and pick up your items from the store's designated area. No lines. After work you may turn on the TV to catch up on the latest headlines. But given how most news isn't good news, after a few programs you may notice your anxiety level rising. This feeling isn't all in your head. A national survey of more than 2,500 Americans conducted by NPR, the Robert Wood Johnson Foundation, and the Harvard School of Public Health found that 1 in 4 participants experienced "a great deal of stress in the previous month," and the biggest contributing factor was reading, watching, or listening to the news. Additionally, a study conducted after the Boston Marathon bombing found that "people who exposed themselves to six or more hours of media daily actually reported more acute stress symptoms than did people who were directly exposed — meaning they were at the site of the bombings," says professor Alison Holman of the University of California. We should stay up-to-date on national and world events, sure. But try limiting yourself to only 10 or 20 minutes of news coverage a day. We can be our own worst enemy and our own stress trigger. Some people have to do everything perfectly, and mistakes are unacceptable. However, nobody is perfect, and if you're reaching for perfection, you're only going to succeed at stressing yourself out (which is why Xanax is my best friend). Do your best, but know your limits (and I'll try to practice what I preach as well). Between smartphones, tablets, and unlimited data plans, you can be connected to the outside world 24 hours a day, seven days a week. But there's a connection between stress and overuse of technology. And if you can't go 30 minutes without checking your email or text messages, you may experience higher stress levels than someone who completely unplugs. Sure, you may need your smartphone or tablet, but it's okay to set boundaries. Maybe shut down all devices two or three hours before bed to allow your mind time to unwind. This means no playing games, texting, reading blogs, and definitely no paying bills online. It'll be hard to break this habit, but people have put more difficult addictions to rest. You got this if you want this. What are some other stressors that are commonplace that we can feasibly avoid? Let me know your suggestions and tips in the comments below. Wanting trendy things at the same time that EVERYONE wants to buy it or have it. Like wanting to watch a premier movie and the collateral damage of paying stratospherical prices just by the luxury to be first one to have it or to say you were the first one to see it. This is one of the greatest stress activators.